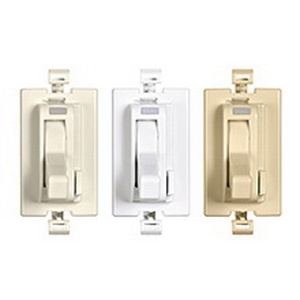 Cooper Wiring Device 1-Pole 3-Way Dimmer has voltage rating of 120-Volt AC. The integrated full-slide control of this dimmer, allows easy, precise operation. Dimmer in light white/ivory/almond color, has toggle/preset actuator that helps in controlling the brightness of the light. It has polycarbonate housing and aluminum strap with gloss finish. It has back and side wiring for easy installation. It has maximum load capacity of 300-Watts. Wall mountable dimmer measures 1.8-Inch x 1.3-Inch x 4.19-Inch. The adjustable rapid start feature of this dimmer ensures lamp start-up even at low dim levels. It is ideal for residential and light commercial applications. It is suitable for use with most dimmable LED and CFL lamps. Dimmer operates at temperature range of -20 to 70 deg C. It is UL 94 V2 flammability rated to withstand harsh environmental conditions. Dimmer is cULus/UL listed and NOM certified.